Hieronymus Bosch (c 1450–1516), Saint Christopher (detail) (c 1490-1500) (CR no. 7), oil on oak panel, 113.7 × 71.6 cm, Museum Boijmans Van Beuningen, Rotterdam. Photo by Museum Boijmans Van Beuningen, via Noordbrabants Museum. An extraordinary and masterful portrait of this popular saint, based on the traditional motif, but elaborated with several features unique to Bosch. Credits: Photo by Museum Boijmans Van Beuningen, via Noordbrabants Museum. Saint Christopher is among the most widely venerated saints – his image appears on almost anything associated with travel and travellers – but seems to have only a tenuous relation with historical reality; modern scholars consider that he corresponds to Saint Menas. His representation in paintings is almost invariably based on the far more dubious accounts in the Golden Legend of the thirteenth century. According to those legends, he was originally a fearsome giant about 2.3 m tall, named Reprobus (Latin for ‘rejected’). When a servant to the King of Canaan, he decided that he wanted to serve the greatest king that there was. Finding a king with such a reputation, he saw that king was afraid of the devil, so went in search of the devil. He discovered that the devil feared Christ, so went in quest of him. He met a Christian hermit, who advised him to fast and pray, suggesting that because of his strength and size, he should help people across a dangerous river. One day when he was doing this, a small child asked him for assistance in crossing the river. Reprobus lifted the light child onto his back, and started to cross the swollen river. As he did so, his burden became heavier and heavier, until it felt like he was carrying the whole world. On reaching the other side, the child revealed himself as Christ, and told Reprobus that he had carried not only the whole world, but God himself. Reprobus converted to Christianity, assuming the name Christopher, ‘bearer of Christ’, and was eventually martyred when visiting Lycia. His attributes are a tree (usually used as a staff, and still sprouting fresh leaves), a branch, portrayal as a giant or ogre carrying Jesus, a spear, a shield, and he may be shown as a man with a dog’s head. Hieronymus Bosch (c 1450–1516), Saint Christopher (c 1490-1500) (CR no. 7), oil on oak panel, 113.7 × 71.6 cm, Museum Boijmans Van Beuningen, Rotterdam. Photo by Museum Boijmans Van Beuningen, via Noordbrabants Museum. Christopher/Reprobus, a huge giant, carries Christ, a small child, on his shoulders across a small lake, set in an extensive and deep coastal landscape. 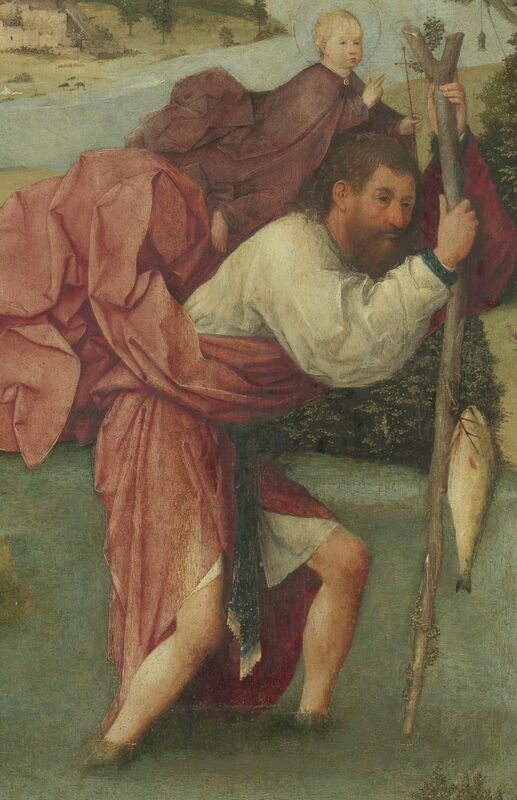 Christopher bends under the apparent weight of Christ, supporting himself on his staff. 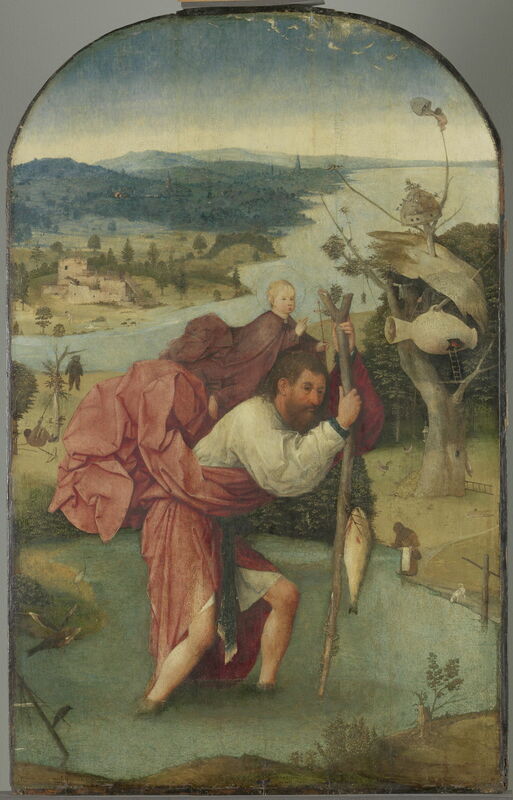 The figure of Christ, and the head of Saint Christopher, are at the centre of the painting. Christ is shown as a young boy, with fair hair, making a sign with his right hand associated with a blessing of peace. In his left hand, he holds a slender crozier. He wears long robes which appear to have been a purplish brown, fastened at the throat, which billow out behind him. He is partly kneeling on the shoulders of Christopher. The figure of Christ is in proportion to that of Christopher, and Christ’s head has an outline halo which is just visible. Christopher’s body and legs are flexed into a Z, angled at about 90˚ at the hips, with his legs flexed at the knees. He is looking towards the viewer, with both hands firmly grasping a very long and thick staff for support under the weight that he is carrying. His face is rubicund and bearded. He wears a white singlet, over which a red outer robe billows out in loose folds behind him. He is walking through water which is slightly deeper than his ankles (the water level being slightly above his malleoli, at the base of his lower legs) and his feet are not visible in the water. His long staff forks in a Y at the top, at the level of Christ’s head, from which fresh leaves are sprouting. There are further leaves lower down, towards its base. Strung from it at mid-height is a very large dead fish, which bleeds red blood from a wound near its mouth. Christopher is walking across a small lake, roughly the same distance across as he is high, from left to right. At the left side of the lake a flying fish is in mid-air, at the same height as his knees. A black bird is perched on the rigging of a mast of a sunken vessel. At the edge of the lake are a heron, bushes, a person wearing a brown habit and white apron, carrying a brown jug, and a white dog drinking the water. The creatures around the lake are extremely small in comparison with Christopher and Christ. On the bank on the far side of the lake, at the left, a hunter with a crossbow has shot a dark brown bear in the mid-chest with a bolt, and is pulling it up on a tree which resembles a gallows, with the rope around the bear’s neck so as to hang it. On the far bank on the right is a strange tree, reaching almost to the top of the panel. Its trunk is very broad at the base, where there are chickens around a dung-heap, a ladder resting on the ground, and a dead fox hanging head-down from the trunk. A quarter way up, the trunk branches, and there is a platform; a ladder leads up from that platform to a hole in the side of a very large pottery vessel, which is suspended from a higher branch by its handle. There is a small fire inside the hole. A figure stands at the open mouth of the vessel, holding a rope which suspends a lantern from a branch above. Above the vessel, another man appears to be on a line which runs diagonally down a section of the trunk. Higher still a pale robe is strung out to dry. Above that is an improvised thatched roof, which is pierced by two of the rising branches of the tree. One of those branches terminates just above the roof in a dovecote, on which eight birds are perched. One branch continues up almost to the top of the panel. Clinging to its top, where it is very thin, a man appears to be handling another smaller dovecote. A landscape stretches behind, from a river opening into the sea (or large lake) back to rolling densely wooded hills at the horizon. On the far bank of the river there is a ruined castle; within its walls is a crocodile-like creature. A naked bather by the shore is fleeing, with their arms held in the air. Midway into the distance, in dense forest, is a village with a church and prominent tower and steeple. To the left of that church there is a building on fire. There are other villages and buildings scattered around the forest as it stretches into the far distance. The central part of this motif, of Christopher bearing Christ on his shoulders, has been the most common form to depict this saint, and this legend. There are inevitable differences in the precise composition of the figures, and in the settings in which they are placed. Konrad Witz (1400–1447), Saint Christopher (c 1435), panel, 102 × 81 cm, Kunstmuseum Basel, Basel, Switzerland. Wikimedia Commons. 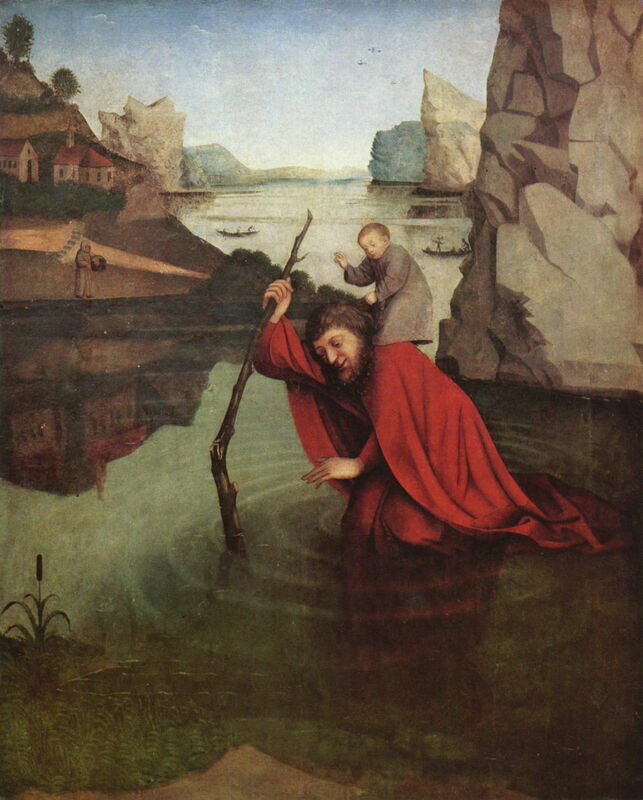 Konrad Witz’s panel from about 1435 sinks Christopher almost up to his thighs in the water, and Christ is perched precariously on his shoulders. His landscape is both more rugged and enclosed. Dieric Bouts (c 1420-1475), Saint Christopher, panel from the altarpiece The Pearl of Brabant (1467-8), 62.6 × 27.5 cm, Alte Pinakothek, Munich. Wikimedia Commons. Dieric Bouts’ exquisite panel from his altarpiece The Pearl of Brabant (1467-8) sets Christopher up quite upright, and makes the surrounding cliffs even more tightly enclosing. Hans Memling (c 1433–1494), Saint Christopher (c 1480), oil on panel, 48 × 17 cm, Cincinnati Art Museum, Cincinnati, OH. Wikimedia Commons. Slightly before Bosch’s painting, Hans Memling (c 1480) allows his Christopher to stand tall, and places him just outside a mediaeval town. He also includes two important variants in the attributes: the staff forks at its top, with leaves growing from it, and behind on the right a monk holds up a lantern to guide Christopher when crossing the river, even though it is full daylight. 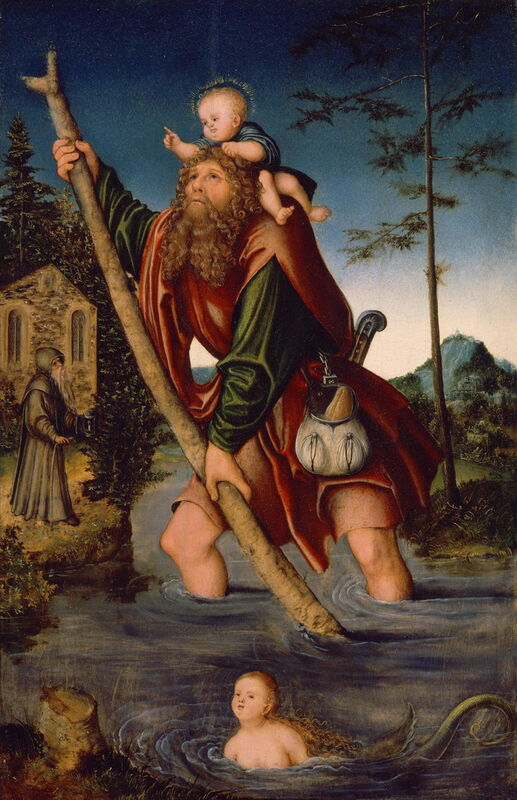 Lucas Cranach the Elder (1472–1553), Saint Christopher (1518-20), oil on lime, 41.9 × 7.9 cm, Detroit Institute of Arts, Detroit, MI. Wikimedia Commons. Lucas Cranach the Elder, painting slightly later in 1518-20, flexes Christopher much in the way that Bosch has, and places the two figures in more open countryside. He too adopts the added attributes of the fork at the top of the staff, and a monk on the bank bearing a lantern. He has also added a putto-mermaid in the foreground, a chain, bag and other equipment on Christopher’s belt, but is one of the few artists to show the river in spate. Against these, Bosch adheres to the two key figures, and the enhanced attributes of the forked staff with foliage, and guiding lantern. In almost everything else, most prominently the relative scale between Christ/Christopher and the rest of the painting, Bosch has departed from tradition. Little seems to have been written about the relative scale, but those contemporary paintings depict Christopher as having no more than above average stature for an adult male. Bosch’s figure is apparently more than 20 metres tall, and the surrounding creatures are truly miniature in comparison. His coastal background is also most unusual. Bosch’s painting contains a wealth of detail, much of it elaborating the original legend in a most unusual manner. The fish – a traditional symbol of Christianity, derived from word-play in Greek – bleeds in association with Christ’s suffering on the cross. The extraordinary vessel hung from the tree at the right refers to Christopher’s earlier association with a hermit, and provides the means of incorporating a guiding lantern. After those, symbolic and allegorical interpretations seem to run into difficulty, as explanations of his idiosyncratic details. They could refer to other episodes in the legends associated with Saint Christopher, or perhaps to contemporary prints or paintings which are now obscure or lost. It has been proposed that Christopher has been transformed into a model of Christian behaviour through the many dangers of life. Together – flying fish, the hung and shot bear, the naked bather fleeing a crocodile, and the distant fire – these details create a world which is strangely disturbing, not quite right, sinister in parts. It is a world familiar to Bosch’s paintings. This painting has not apparently been the subject of any dispute as to it being an authentic work by Bosch’s hand. Although now badly worn, it is signed at the bottom left. Most of its more peculiar details were only added late in the painting process, and there is no evidence of any significant overpainting or other alterations made after its original completion. Matthijs Ilsink, Jos Koldeweij et al. (2016) pp 18-187 in Hieronymus Bosch, Painter and Draughtsman: Catalogue Raisonné, Yale UP and Mercatorfonds. ISBN 978 0 300 22014 8. Posted in General, Painting and tagged Bosch, Bouts, Cranach, Memling, painting, Witz. Bookmark the permalink.